Smart Car Forums > Technical > 450 > smart Wheels & Tires > Maryland Blizzard of 2010! --> Mattracks! Maryland Blizzard of 2010! --> Mattracks! We have been getting pounded with snow recently, which lead me and my brother onto a wild search for a Snowmobile, and somehow we came across this! .. http*://ww*w.mattracks. *com .. Here is a direct link to a video: http*://ww*w.youtube. *com/watch?v=zwzUJJUy9Gk .. Anybody heard of this before? How about on a Smart!?!? Ps: i'm too new so I cant post actual links.. please remove the '*' signs to reveal the actual URLs.. Sorry! You need a 4x4 vehicle for them to work correctly, as it states on their website. I have never seen them being used. I ain't clicking on any link posted by a newbie who posts into a 9 year old thread. Link is safe, I tested it when they first joined. It looks pretty awesome! OK. Why the tracks on the front? Wouldn't skis be better? Skis are great for downhill (gravity assist), and work well on snowmobiles where there's an abundance of power. But skis require pushing, while driven tracks pull. Hard to brake going down a 100% slope as well. 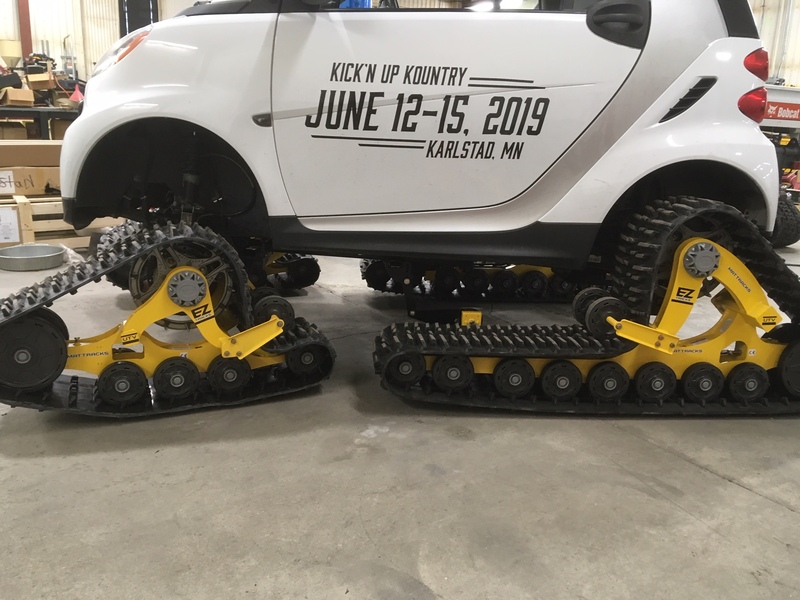 This vehicle is designed for mud, sand, snow and gravel...Skis, would be worthless beyond snow, but a lot easier to install!!! What's the top speed like with these tracks?